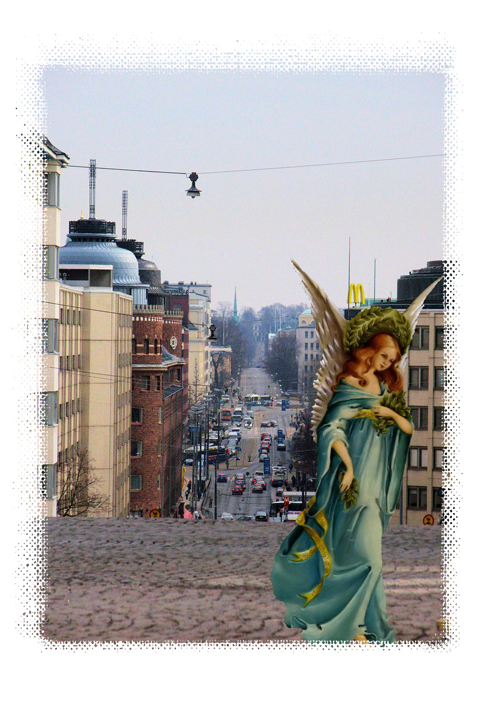 For the full Angels in Kallio Exhibition, click HERE! Sundry musings on the aesthetically inspiring pictures: since angel literally means messenger in Hebrew, it speaks well for the Kaillio community that it welcomes them without confusing message and messenger. There is unfortunately a nasty habit among humans living in Europe since the 17th century, especially those living in affluent neighborhoods, to beat-up the postman delivering unwelcome news or inveigh against the sender of the message. That is conceived as an “enlightened” stand nowadays. Of course it is much easier for angels to get away from those who do not like their message than it is for human messengers. The latter go by the name of prophets. More often than not they end up losing their head or at least receiving a good trashing for delivering unwelcome messages and inconvenient truths.